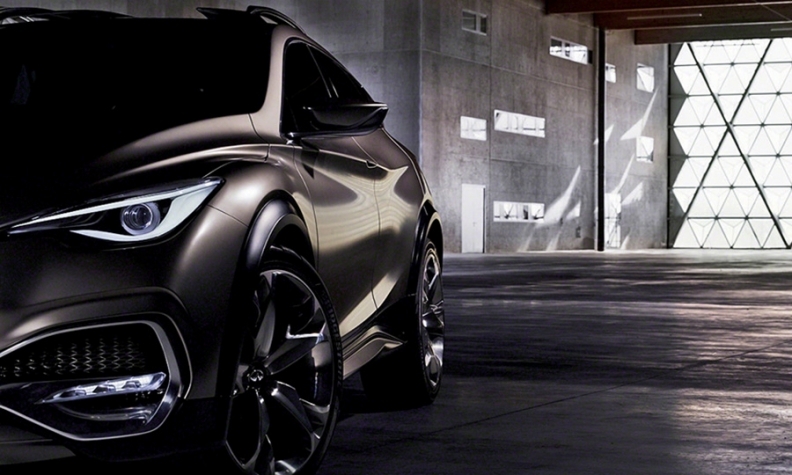 Infiniti's new trio of compacts will include the QX30 crossover, shown here as a concept. The production version will debut at the Los Angeles Auto Show next month. SAN DIEGO -- Infiniti's upcoming trio of compact models will be marketed primarily as a family of luxury vehicles rather than individually. The strategy will enable Infiniti to offer a spectrum of choices with varying degrees of sportiness, says Randy Parker, vice president of Infiniti Americas. "We want to show them as a group." Parker said here during Infiniti's introduction of the re-engineered QX50 crossover. "We'll be showing all three of them together in the same TV spots." The trio will roll out over the next year, starting with the Q30 compact five-door hatchback. That car will come in two forms -- a standard Premium version and an SE model with a body that has been lowered almost an inch to create a sports package. The third member of the family is the QX30 crossover. The production version of that model will make its global debut next month at the Los Angeles Auto Show. Observers at auto shows have remarked on the concept vehicles' similar appearances. Parker acknowledges that even the similarities of their names -- Q30 and QX30 -- might initially trip up some shoppers. But they are a vehicle family, he says, built on shared architecture to offer buyers choices within the compact segment. The Q30 and QX30 are built on the Mercedes-Benz A-class platform, along with the Mercedes GLA crossover. Infiniti will receive some of the earliest fruit from the global technology-sharing efforts between Daimler and the Renault-Nissan Alliance. The U.K.-built Q30 makes it to U.S. showrooms next spring, with the QX30 arriving just after midyear.